The progress that Montgomery County Community College has made in student retention and completion as part of its participation in an elite group of thought leaders in education is documented in a 2014 report presented during a presidential summit at the White House on Dec. 4. The progress report is a follow-up on commitments made at the Jan. 16, 2014 College Opportunity Day of Action, designed to expand college opportunity for all students. The national dialogue on college readiness began on Jan. 16, 2014 during a Summit convened by U.S. President Barack Obama. That summit saw approximately 140 leaders from higher education, philanthropic organizations, businesses and local and state governments launch a plan of action for increasing college opportunity for low-income and disadvantaged students. Through Dr. Stout’s participation in the White House Summit, the College has focused on three specific initiatives aimed at improving access for low-income and disadvantaged students. These include redesigning student entry and advising processes, developing a multi-platform model for student engagement, and expanding its minority student mentoring initiative. All three programs are part of the College’s Student Success Initiative, which works to expand access to higher education and increase student success through innovative process improvements and support strategies that reduce the barriers for students to complete their education. In 2011, Montgomery was designated an Achieving the Dream Leader College, an elite group of 73 community colleges across the country that have demonstrated committed leadership, use of evidence to improve programs and services, broad engagement, and systematic institutional improvement. In February, the College earned the prestigious Leah Meyer Austin Award from Achieving the Dream for its continued improvement of student access and success. College Opportunity Commitment: Montgomery County Community College committed to help low-income students successfully complete a certificate or degree at the College. First, to improve student retention and completion, the College reviewed and then redesigned the student entry and advising process. The technology integration included four components: early alert, a self-service student appointment scheduling, student academic planning, and student/faculty dashboards that support student academic planning and advising. Second, the College is developing “New Literacy” modules designed to support student success in three areas: financial, digital, and civic literacy. The initiative is supported through the EDUCAUSE Next Generation Learning Challenge (NGLC) Breakthrough Models Incubator (BMI13). The third initiative, the Minority Student Mentoring program, provides each participant with a personal mentor. College faculty, administrators, and staff volunteer are mentors that support and guide their mentee throughout their College engagement. Additionally, this cohort of students receives support from the Office of Minority Student Mentoring including personal development workshops, academic advisement, and leadership development. Progress Made: In spring 2014, the College implemented student self-service appointment scheduling and piloted a student early alert system. The early alert system launch resulted in 93% faculty participation compared to an average 71% participation in previous semesters. As of fall 2014, the early alert system has been fully implemented, with all faculty encouraged to send student alerts as needed. Many faculty are also using the early alert system to send kudos to students. Additionally, all new fall 2014 full-time students will be meeting with their academic advisors to develop their student educational plan. Currently, the College is working on designing dashboards that include data on educational planning, demographics, and course participation. Over the past year, the College has developed and implemented an online resource that supports financial literacy, a social media campaign to support the Next Generation Learning Challenge (NGLC) and a series of 30 second information videos on various financial literacy/services topics. The online resource created, Montco Money Matters, is open source and available through Blackboard CourseSites. In addition, in May 2014, the College was awarded an additional NGLC BMI13 grant to further develop financial, civic, and digital literacy online resources. Early results of this investment have shown a decrease in the number of students cancelled for non-payment. Finally, over the past year, students who participated in the Minority Student Mentoring program persisted at a rate higher than non-participants (73% compared to 66%) and 25 students graduated. Holly Gately, Audubon, found a new career—one that she’s “excited” about—in the growing field of medical billing and coding thanks to Montgomery County Community College. “I was a 30-something year old mother whose children were all in school for the first time. I had no career or post-secondary education,” shared Gately, who, like many adult students, was nervous about going back to school. “I talked about it with my family and decided to try this new career. I registered for class and got my books. My life was changed. This was a path I could get excited about,” she said. The College’s Medical Billing and Coding course—funded in part by the Trade Adjustment Assistance Community College and Career Training (TAACCCT) grant from the U.S. Department of Labor and offered through the Commonwealth’s JobTrakPA program—is designed for those who want to begin medical billing and coding careers or prepare for certification examinations. The course teaches students the principles of medical coding using the health industry coding manuals of CPT, ICD-9 and ICD-10 and HCPCS. “It wasn’t always easy to get all the homework and studying done with family [obligations], but I thrived. I excelled in the course and was given the opportunity to extern for a billing company,” said Gately, who completed the course among the top in her class. Gately went on to pass the rigorous Certified Professional Coder (CPC) Exam on her first try, and she is currently employed in a billing and coding position with an ophthalmology practice. “I am so glad that I decided to take a chance on a new path. I have a new career, self confidence, amazing people that I now call friends, and, most of all, I have pride in knowing that I accomplished something big and wonderful,” she said. The U.S. Bureau of Labor Statistics’ Occupational Outlook Handbook cites that careers in medical records and health information technology are expected to grow by 22 percent through 2022—11 percent higher than the average occupation growth rate. Registration is going on now for the next Medical Building and Coding cohort at MCCC. 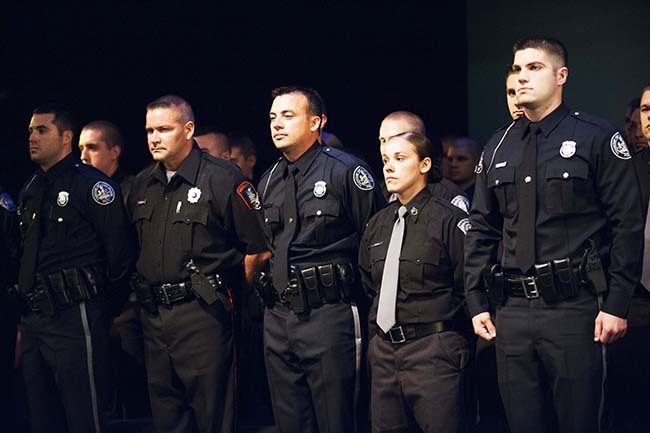 The class will meet Tuesdays and Thursdays from 6-10 p.m. and Saturdays from 8 a.m.-5 p.m. (with a one hour break for lunch) starting Dec. 2 and running through Feb. 17 at the College’s Central Campus, 340 DeKalb Pike, Blue Bell. Tuition is $1,350. For more information about JobTrakPA programs at Montgomery County Community College, visit mc3.edu/workforcedevelopment/jobtrak, call the JobTrakPA hotline at 215-461-1468 or email jobtrakpa@mc3.edu. Montgomery County Community College continues to position itself at the forefront of student learning with recertification as a Leader College by Achieving the Dream: Community Colleges Count (ATD), a national non-profit organization committed to helping more community college students succeed. Even before joining ATD in 2006, the College was hard at work improving student learning outcomes by placing student access and success as top priorities in its strategic planning. As part of its overarching Student Success Initiative, the College’s faculty and staff systematically examine all aspects of its students’ educational experiences both inside and outside the classroom—from enhancing student services, like advising and mentoring; to identifying and developing interventions for at-risk cohorts; to redesigning developmental curriculum and placement; to strengthening its focus on completion and increasing transfer opportunities. Several of the College’s student success projects have national appeal. For example, Barbara Lontz, assistant professor of mathematics, developed a new way of teaching basic developmental math by conceptual units rather than topics. Her curriculum, “Concepts of Numbers,” encourages active learning by starting with a problem, solving it as a group, and then learning the applicable algorithms. The method has increased basic math success rates by 20 percent and math confidence rates by 20-35 percent at the College, and institutions are adopting Lontz’s curriculum and textbook across the U.S. “Concepts of Numbers” was honored as a national 2010 “Innovation of the Year” recipient by the League for Innovation in the Community College. 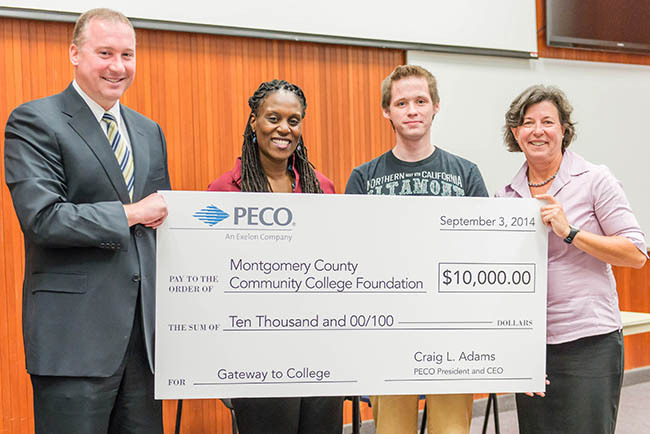 Another example of a project with broad appeal is “Montco Money Matters” a multimedia financial literacy prototype that helps students understand how to pay for college. The 30-minute, self-guided pilot program, funded through a Next Generation Learning Challenges EDUCAUSE grant, introduces students to the concept of paying for college through topics such as financial aid, loans, grants, scholarships and the long-term implications of current and future debt. The project’s next steps are to build out additional modules under the umbrella of financial literacy and to make the program accessible to school districts within Montgomery County and to the general population at large. In addition to its work with Achieving the Dream and EDUCAUSE, the College’s student access and success efforts continue to gain momentum with President Stout’s participation in White House Summit for College Opportunity. First held in December 2013 and continuing through next year, the Summit has enabled the College to further develop initiatives around student advising and planning, financial literacy and mentoring—specifically designed to improve college access and completion for at-risk students. Montgomery is one of 16 institutions in the country to be recertified as Achieving the Dream Leader Colleges in 2014. ATD also welcomed 16 new Leader College institutions to its ranks, bringing the total number of active Leader Colleges to 79. Other Pennsylvania institutions earning recertification this year include Community College of Beaver County, Community College of Philadelphia, and Delaware County Community College. According to Achieving the Dream, Leader Colleges demonstrate the way in which data can inform policy and practice to help community college students achieve their goals, resulting in improved skills, better employability, and economic growth for families, communities, and the nation as a whole. To learn more about Montgomery County Community College’s Student Success Initiative, visit its website at mc3.edu or its Think Success blog at mc3success.wordpress.com. To learn more about the work of Achieving the Dream, visit achievingthedream.org. Montgomery County Community College was honored for its ongoing commitment to student access and success on Feb. 24 during the annual Achieving the Dream Strategy Institute in Orlando, Fla. The College was one of two institutions presented with the sixth annual Leah Meyer Austin Award by Achieving the Dream. The Leah Meyer Austin Award, sponsored by The Leona M. & Harry B. Helmsley Charitable Trust, was established in 2008 to recognize outstanding achievement in supporting and promoting student success through the creation of a culture of evidence, continuous improvement, systemic institutional change, broad engagement of stakeholders, and equity, with particular attention to low-income students and students of color. Austin, whose visionary leadership shaped the development of Achieving the Dream, is the former Senior Vice President for Program Development and Organizational Learning at the Lumina Foundation, and is a member of the Board of Directors of Achieving the Dream. “The College’s selection as a Leah Meyer Austin Award recipient underscores our continued commitment to advance the areas of student access, success and completion that anchor our work as an Achieving the Dream Leader College,” she continued. In addition to building college-wide solutions and engaging in data-informed decision making, Achieving the Dream commended the College for its work to improve developmental education outcomes, college readiness, and student persistence. One highlight is the College’s efforts to reduce the number of students who place in developmental English by 31 percent, without impacting their subsequent success in college-level English courses. This was achieved through a combination of adjusting placement cut-off scores, moving from an ACCUPLACER placement test to a WritePlacer exam, and allowing students with SAT scores of 500 and up to enroll directly in college-level English. In fall 2011, more than 900 students benefited from these changes, successfully completing Composition I (ENG 101) at the same rate as those students who placed in college-level English under the old cut score. MCCC also continues to build momentum in its efforts to improve success in developmental mathematics. The College was previously recognized by Achieving the Dream for the complete redesign of its basic arithmetic curriculum, which increased student success rates by 20 percent and math confidence rates by 20 to 35 percent. MCCC also developed two-week accelerated basic arithmetic and beginning algebra “boot camp” review courses for students whose ACCUPLACER test scores are close to the cutoff. To date, 300 students have completed the accelerated courses, outperforming students who follow the traditional path. Achieving the Dream also noted MCCC’s efforts to improve the college readiness of students from feeder high schools through a variety of initiatives. Among these is MCCC’s participation in the national Gateway to College Network, designed for young adults ages 16 to 21 who have dropped out of high school or who are significantly behind in credits and are unlikely to graduate. The program enables qualifying students to complete their high school diploma requirements while simultaneously earning college credits toward an associate’s degree or certificate. In addition, MCCC developed a College Pathway Academy for Health Professions in partnership with the Phoenixville School District and Phoenixville Hospital. The Academy enables students to earn college credits in the health sciences while completing their high school graduation requirements. Another highlight is the College’s success in improve persistence rates for minority students. In 2009, the College first launched its Minority Male Mentoring Program (MMMP) to close the nationally documented achievement gap for African-American male students. The program connects participating students with caring mentors for guidance and support while providing opportunities for civic engagement, academic advisement, personal development and leadership development. Between 2009 and 2013, participants showed a term-to-term persistence rate of close to 80 percent – significantly higher than the 63 percent for non-participants. This spring, the initiative was expanded to include African-American and Latina female students and was renamed the Minority Student Mentoring Initiative (MSMI). To learn more about MCCC’s Student Success Initiative, visit its website at mc3.edu or its Think Success blog at mc3success.wordpress.com. Achieving the Dream, Inc. is a national nonprofit leading the nation’s most comprehensive non-governmental reform network for student success in higher education history. The Achieving the Dream National Reform Network, including over 200 institutions, more than 100 coaches and advisors, and 15 state policy teams – working throughout 34 states and the District of Columbia – helps nearly 4 million community college students have a better chance of realizing greater economic opportunity and achieving their dreams.